Cruise on the sandy shores of Fraser Island in your own 4WD for the trip of a lifetime! 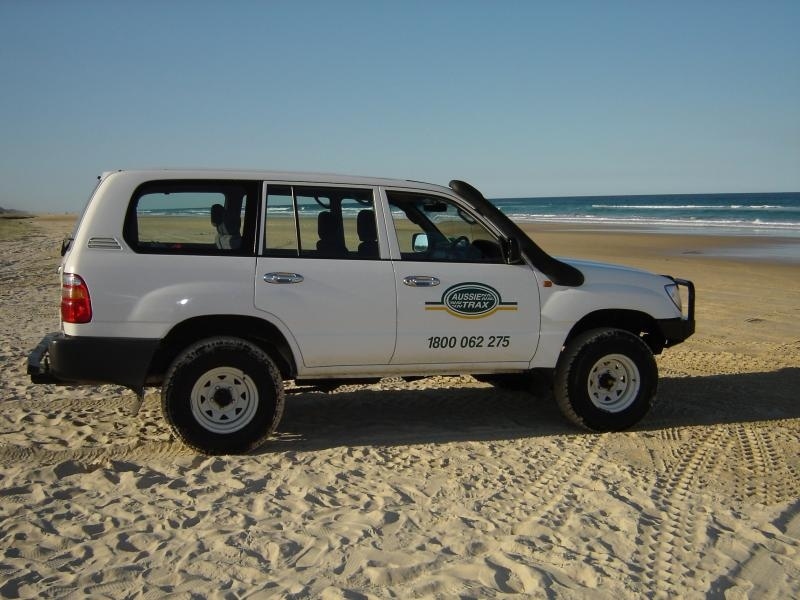 Book your own 4WD and see Fraser Island first hand! With Aussie Trax you can book for 2 or 3 days and explore all the parts of Fraser Island that you want. Let us plan out an itinerary that is right for you and help you to have the adventure of a lifetime! With input from your group, your travel experts will map out the perfect trip for you so you can enjoy Fraser Island the way you'd like. Your planned trip will be dependent on the tides and where you want to go, making sure you have enough time to make it to all the places you want on the island! Be sure to visit top spots like Lake McKenzie, Eli Creek, Champagne Pools and Central station! You can rent your own 4WD and go on the adventure of a lifetime on Fraser Island. This is the ideal way to travel the independent traveller who wants a full-on experience on Fraser Island! Aussie Trax offers a reliable way to experience the world's largest sand island at its best. In your own vehicle, you're in command of your own trip, choosing to do your trip your way. You can choose to spend as little or as much time at each destination as you'd like to make it a trip that's all yours. Choose where you'd like to stay for the night and incorporate it into your Fraser tour, taking along any necessities you will need for your excursion and start setting your own 'trax' on Fraser Island! Please note rentals range from 2 - 3 nights and prices vary depending on how many people are renting the vehicle together. There can be up to 8 guests per trip. Please enquire about pricing. *Please advise at the time of booking if an automatic is required. There are so many amazing sites and destinations on Fraser Island. In order to see the best of them, you can work with your travel experts at Aussie Trax to map out an itinerary and timeline that works best for your trip! It is recommended you stick to the itinerary that is provided to you... this will be the best and safest way to ensure you see all the sights on your 'must-see' list! Driving on Fraser Island is very dependent on the tides and timing changes day by day, so each and every itinerary is personalised and different. We want you to experience Fraser Island in the best way possible, which is your way! *Please note this tour may not be suitable if you have existing neck or back problems or are pregnant. Check with your agent to make sure this tour is suitable for you. Please pack a small overnight bag, change of clothes, swimwear, food and drinks, hat, sun cream, sun glasses, towel and camera. You will also need to bring along any food or drinks you may want, or purchase them on Fraser Island. Please note rentals are unavailable from Dec 15 - Jan 15. Drivers must present current drivers licence (international is fine). Please advise at the time of booking if an automatic vehicle is required. We require a AU$500 credit card imprint as bond, which is not banked unless the car is not returned satisfactorily. Staff cover these issues in more depth during the briefing. Customers may take the waiver option, which can reduce their liability. This is non-refundable and is purely a personal insurance option. It is not compulsory. In group situations (usually backpackers who don't know each other) there is a form that everybody signs to ensure every person is jointly liable for the car not just the credit card holder, if the vehicle was damaged. All client cancellations forfeit 25% of total ticket price and all client cancellations made less than 21 days prior to departure will result in complete forfeiture of the full price of the tour or package. If the tour operator has to cancel the trip or activity (prior to the departure) and we cannot offer a suitable alternative, then a refund will be given minus card fees. We strongly recommend that you have travel insurance. Refunds do not apply to hires cut short due to: Bad weather, Shortening of the rental period by the hirer - unless it can be re-hired for that same period, cars taken from the hirer due to misuse in contravention to Aussie Trax's or other authorised persons' directions. Thank you for booking with Mr Travel if you need any advice or assistance making arrangements for other tours please do not hesitate to ask. "Aussie Trax 4x4 was a perfect way for us to enjoy Fraser Island by ourself ! We took 6 people 4x4 with the best camping we ever did in Australia !! Thanks again, if we come back in Fraser, we'll go back with your cars !!"